The genesis of this book was two sentences that popped into my head and wouldn’t let me go. I have always been a soldier. I have known no other life. I knew immediately that these were the first two sentences of a book. And I liked the book. I liked it a lot. But I had no idea who was speaking those sentences, or where the book was set, or what time period, or what happened, or anything. Detail from the mosaic of Alexander the Great at the Battle of Issus, 333 B.C. Somehow, a few months later, I realized that the speaker of these sentences was Alexander the Great. I believe in the Muse. I believe that inspiration comes from another dimension of reality, a dimension that is far wiser than our limited material sphere. You, the writer, resist the call of that dimension at your peril. I believe the writer’s role is something like the detective’s. You receive an assignment and you follow it to the end. 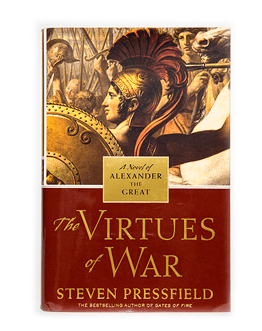 The Virtues of War was a mind-bender for me because I had to write it in the voice of Alexander the Great. How can you do that? What do I know, what experience do I have in my life, that would allow me to project myself into the mind of the greatest conqueror and military genius in the history of the human race? She knows, even if you don’t. I have another belief about the Muse. I believe she teaches you. The ideas she inspires you with are not random. They unspool, one succeeding another, in a very specific sequence for a very specific reason. (Think of the albums of Bob Dylan or the novels of Philip Roth). The writer’s life is not about self-expression. It’s about self-discovery.